Create a welcoming casual dining room with this pedestal table with a laminate top. The table's Legacy Oak finish brings out warm tones, while one included leaf lets you extend the table length for extra seating and serving space. Move about with ease in this casual caster swivel arm chair. 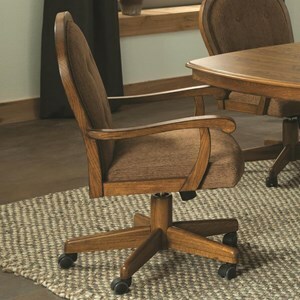 The swivel dining chair is upholstered in a light brown color that complements the Legacy Oak finish. 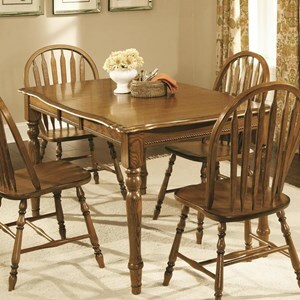 Creating a charming casual dining room with this classic leg table. The table's turned legs and solid oak construction exude classic American style. One 12" leaf lets you expand the small-scale table for extra seating and serving space. 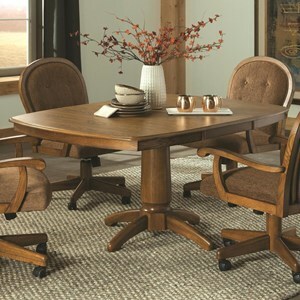 Create a welcoming casual dining room with this pedestal table with a laminate top and caster swivel chair dining set. The table's Legacy Oak finish brings out warm tones, while one included leaf lets you extend the table length for extra seating and serving space. Brooks Furniture was founded in 1954 in Middlesboro, KY, by Dr. J.H. Brooks, Sr. The product line began with solid cedar wardrobes and chests. In 1956, the factory was moved to its present location in Tazewell, TN. The line was upgraded to manufacture bedroom suites and bunk beds produced from several different species of lumber. In 1963, the company was joined by Jerry H. Brooks, Jr., who is presently the company CEO. Dr. J.H. Brooks retired in this same year. In 1966, the company expanded its product line in the field of upholstery and created a separate division. This division was known as Brookline Upholstery. Brookline was a manufacturer of fully upholstered living room suites, occasional, chairs, and recliners. In 1973, the company expanded their operations by establishing their own lumber mill, known as Brooks Sawmill Division. The primary production was the milling of oak lumber which produced over one million board feet annually. In 1977, the company was joined by the third generation, Michael Brooks, who presently serves as President of the company. In 1986, the company expanded their product line by manufacturing glider rockers. Over the next few years the glider rockers grew so rapidly that in 1990 the company converted all of their manufacturing facilities solely to the production of glider rockers. Since 1990 the company has made several expansions to its facilities and now has over 200,000 sq. ft. of manufacturing and warehousing capacity. In 2001, the company expanded their product line by importing Oak dining room suites. The dining room division now has several collections ranging from traditional to casual/contemporary styles and species of wood such as oak, birch and walnut. In 2004, the company was joined by the fourth generation, Chris Brooks, who presently serves as the Director of Marketing. In 2007, the company again expanded their product line by importing leather/match recliners. All recliners have patented Leggett and Platt (L&P) mechanisms, top grain leather, and a coil spring seat unit to ensure long lasting comfort and to withstand years of use.